There is something powerful about the moonlight. I think Kenny Chesney got it right in the song "When the sun goes down". Everything truly does get hotter. Most of the time, we snuggle in and don't bother going out in the moonlight. Occasionaly, we get out there and it is almost always magical. Especially along the water. Seeing the moon reflect off the water is a peaceful romantic thing. I highly recommend you get out there and experience it with your love. Romantic Tip: Take a moonlit walk on the beach, bay, lake, or any other romantic place. Getting on the water for us, almost always means we will stop at the Brig for our favorite New England Clam Chowder. 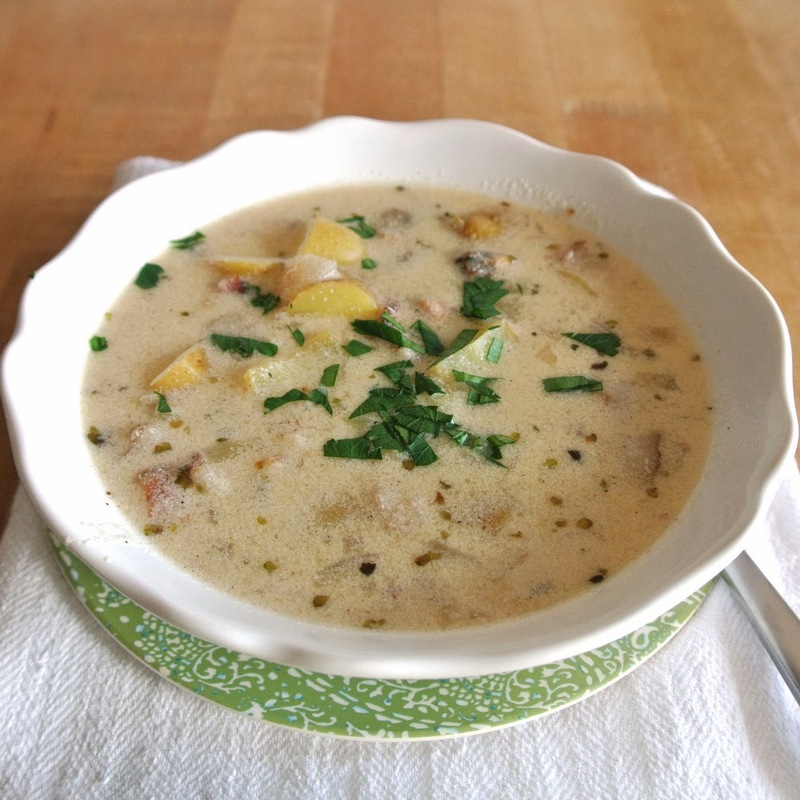 I have yet to find a better chowder here in San Diego. So I decided to learn how to make it from scratch like them at home. That's right. I mean completely from scratch. No canned clams here. It is actually easy, so don't be intimidated. 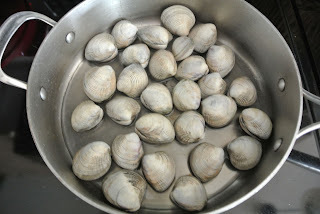 The day before: As soon as you bring your clams home from the store wash the clams with cold water and then put the clams in a bowl with enough salt water to cover the clams ( it should taste like the sea). Put the bowl in your refrigerator. Over the next 24 hours your clams will do their thing and siphon in the clean water expelling most of the grit they hold between their shells. 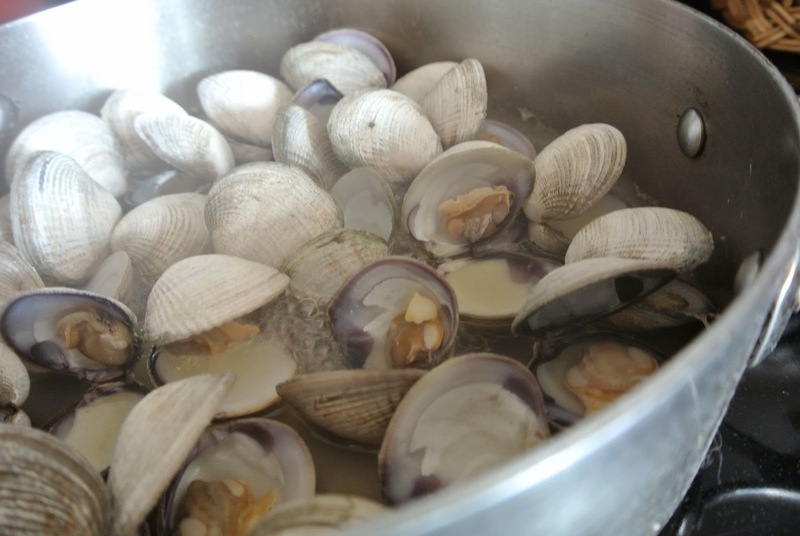 If your clams are really dirty, you may need to change the water periodically. In a wide pot or sauté pan with a lid, add the clams along with 1/2 cup fresh water. Cover and steam over medium high heat until all the clams have opened. 5 - 10 minutes. Remove the pot from the heat and uncover. 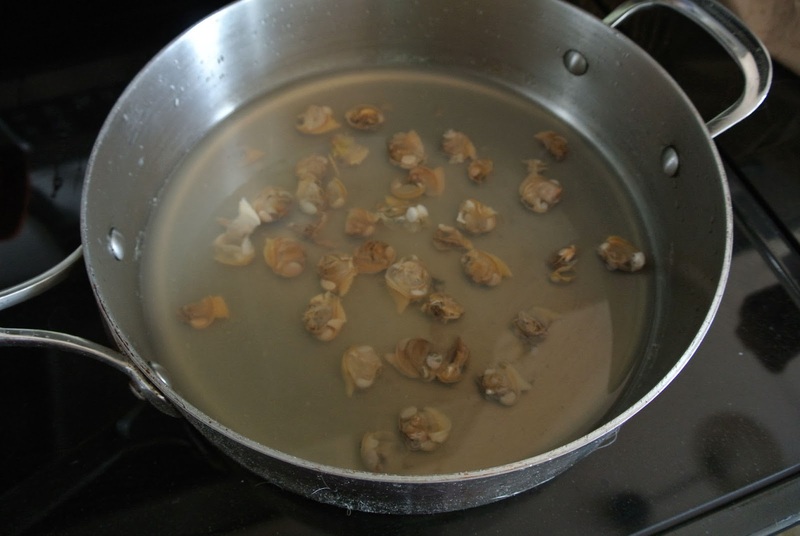 Remove the clam meat from the shells and transfer to a bowl. Discard any unopened clams. Once all the clams have been shelled, slowly pour the clam stock over the clams, leaving the last tablespoon or so of stock along with any grit in the pot. Wash the pot out. Agitate the clam mixture to allow any sand to settle to the bottom of the bowl, then let it sit for a minute to allow all the sand to settle to the bottom. Use your fingers or a slotted spoon to scoop the clams off the top of the liquid being careful not to disturb the sand at the bottom. Once you have all the meat separated, give the stock a few minutes to settle, then slowly pour the clam stock into a 2 cup liquid measuring cup, leaving the last bit of stock and any grit behind. 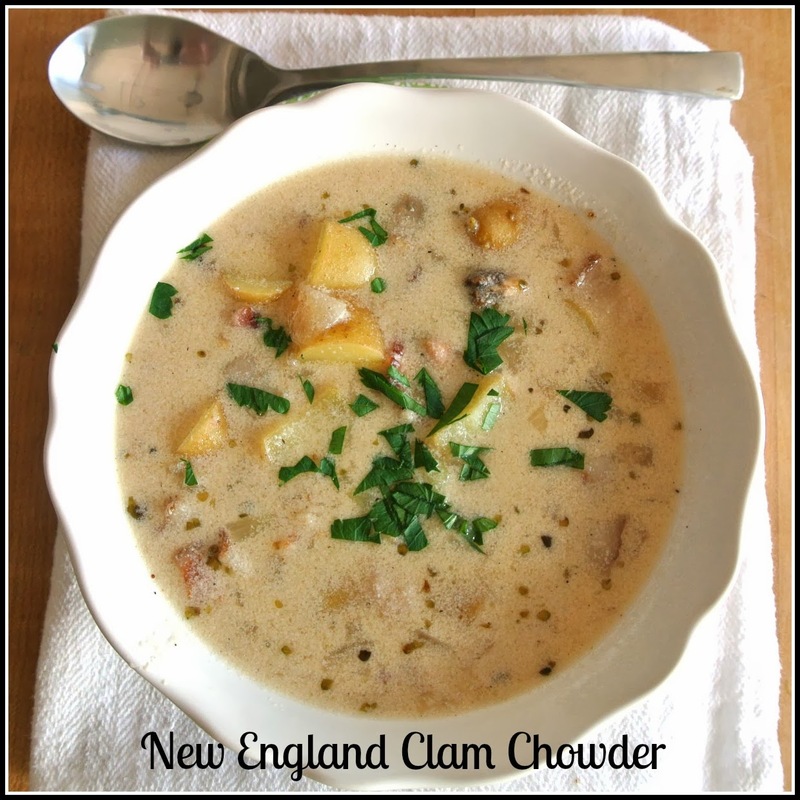 You should have 2 cups clam juice, if you have less, add water to make 2 cups. 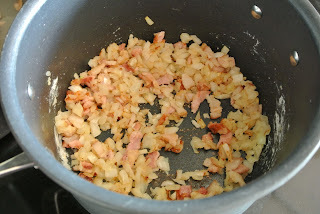 Add the olive oil and bacon to the clean pot and fry until most of the fat has rendered from the bacon and it is starting to brown ( but not until its crisp). Add the onions and sauté until the are tender and browned. Add the flour and continue frying for 1 minute. 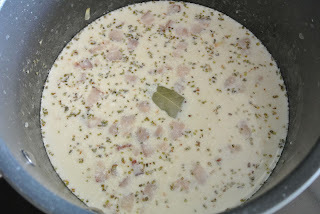 Turn off the heat, then add the clam stock and milk. Whisk together to dissolve the roux, and then add the potatoes, marjoram and bay leaf. Put the pot over medium heat and bring the pot to a low simmer. Do not let the soup boil. When the potatoes are tender, remove the bay leaf and return the clams to the pot. Once the clams have reheated the soup is done.